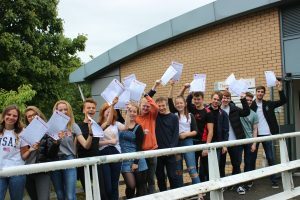 New school records have been set at The Catholic High School, Chester by this year’s A level students. The proportion of top grades is higher than ever, with 10% of entries gaining the coveted A* grade, and the combined A* and A grade score breaking through the 25% mark for the first time. With an overall pass rate of 97% the school continues to set a tremendous record both with the grades achieved and in terms of value added to students’ experience. The highlights among a very special year group include Joshua Jones who heads to Medical School at the University of Cambridge with his three A* grades, Head Girl, Ciara Sinclair who takes two A* grades and one A to Glasgow University to study Veterinary Science, and Head Boy, David Chesters who has A*, A and B and will read Ancient History and History at the University of Leeds. Special mention has to be made of Guy Whale and Charlotte Charlton who both secured two A* grades and two A grades. Once again students at All Hallows Catholic College, Macclesfield are celebrating excellent A Level results. 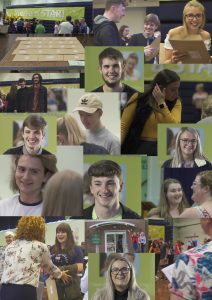 Provisional indicators are that 72% of grades achieved were A*-B grades and 89% A*-C. The majority of students have secured their first choice university place at some of the country’s top universities including Oxford, Durham and Kings College, London, while others have been successful securing very competitive apprenticeships. Chair of Governors, Mrs Jaqui Feely said, ‘I am absolutely delighted with the results of all of our students and would like to pass on my sincere thanks to their teachers’. This year, the highest achieving male and female students are Sebastian Dooley and Josephine Bowers. Seb will be reading Mathematics at Warwick University and Josie, Mathematics at Durham University. Head Boy, Ben Wardle and Head Girl, Megan Edwards are also among the highest performing students. Ben who will take up his place to read Religion and Philosophy at Kings College, London, said,“I have loved my time at All Hallows. The college has been amazing, not only in terms of academic learning but also as a supportive and inclusive community. Thank you so much to everyone for helping me achieve these results. I am so proud of how everyone has done.” Megan, who rejected an unconditional offer in favour of studying Marketing at Liverpool University, said, “The results we have all achieved are not only a reflection of our own hard work, but also that of all the staff who have supported us; we couldn’t have done this without them. Thank you”. 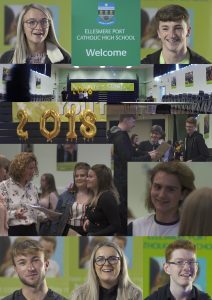 Ellesmere Port Catholic High School 6th Form students celebrated their successes in today’s A-level and AS level results, marking yet another year of excellent academic and personal achievements for students at the school, with an overall pass rate of 99.4%. We want to congratulate all our students and wish them well as they take up their places at university, on apprenticeships, in employment, or on a gap year. Some of our students were able to overcome challenging personal circumstances to achieve excellent results. This was partly due to the support and guidance given to them by the school, and due to their hard work so well done to them as well. Congratulations also to our Year 12 students who achieved some excellent AS results; we wish them well for their final year at the school. There were many outstanding individual performances with Hardik Poptani, from Bebington, achieving 2A* & 2 grades, despite having only arrived in the UK at the age of 15. He will study Mathematics at Warwick University. Haydn Bennett from Saughall Massie, one of triplets, all of whom are off to university, has secured his place to study Medicine at the University of Liverpool.